Why is a licence important to young drivers? How many crashes involve unlicenced drivers? What is the crash risk of an unlicenced driver? What are the driving behaviours of unlicenced drivers? Who is most likely to drive unlicenced? What are the crash characteristics of young unlicenced drivers? What will happen if a driver is caught driving unlicenced? What can the government and law enforcement do to reduce unlicenced driving? What can drivers do to reduce unlicenced driving? Unlicenced drivers are drivers who have a licence that is invalid because it is suspended, revoked, inappropriate, expired or cancelled/denied, or drivers who have not gone through the process necessary to obtain a licence.1 Any driver who is driving without proper qualifications is considered unlicenced. For instance, young and new drivers must pay close to attention to the terms of graduated driver licencing (GDL) programs and understand that each licence stage may have different rules and regulations. 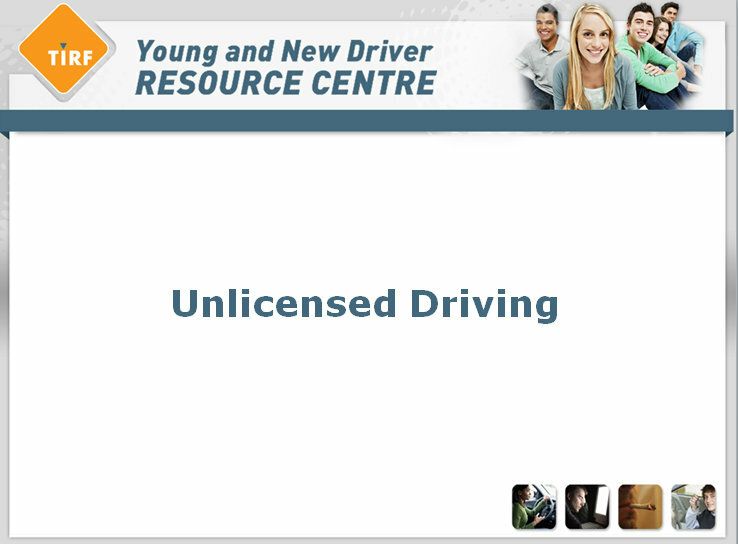 An example of unlicenced driving would be driving without an experienced driver while holding a licence that specifies the young driver must be supervised at all times. Vehicles are the most popular mode of travel, providing both the mobility and freedom2 not offered by any alternatives. Unlike public transit, vehicles can be used any time, any place, and for any purpose. For youth, they are an important tool to maintain a demanding lifestyle. For teens who want to ensure a successful future they need to be able to attend classes, participate in extra curricular activities and hold down a part time job. Without a vehicle and a licence, it is more difficult for teens to maintain a tight schedule, especially if they live far away from their school and activities. Unlicenced drivers are more likely to be male (75%).16 Those who live in economically deprived areas (which are more likely to have poor road conditions and fewer resources such as post-trauma care) are more likely to experience a fatal crash without a valid driver’s licence. Young drivers (who already have a high crash rate) in a deprived environment are more likely to drive without a licence. These youth are also more likely to drive an older vehicle, have limited supervised driving practice time and to be unable to afford a professional driver education course. It is against the law to drive without a licence. The Criminal Code of Canada states it is illegal for a person to operate a vehicle when they are not qualified. Each province deals with the issue differently. In British Columbia, for instance, a first offender will receive a ticket and is not permitted to drive the vehicle any further. A second offender will have their vehicle impounded for seven days and are prohibited to drive until they get their licence. If a driver continues to drive without a licence after these first two offences they are penalized with a $500 fine and up to six months in jail. In Ontario, if drivers are caught with an invalid licence, their vehicle is impounded for seven days (this includes a novice driver who is violating the GDL restrictions). The Ontario Highway Traffic Act specifies driving without a proper licence as an offence with a fine of at least $200 and up to $1,000. Novice drivers will have their licence suspended if they breach any of the GDL program requirements. There are also technologies used by police that can help in detecting unlicenced drivers. Automated Licence Plate Readers (ALPRs) “use cameras and computer software technology to scan plates of motor vehicles that are either mobile or parked. The licence plates can be checked against police and motor vehicle/drivers licence registration databases for the purposes of determining if the vehicle is stolen, unregistered or that it may be driven by a suspended or disqualified driver. An alert given by the ALPR will signal to police that something has been detected”.23 When these devices are available, it is much easier and less time consuming for enforcement to detect unlicenced drivers. Do not drive without a valid driver licence. New drivers must ensure they meet the conditions prescribed in their level of the GDL program. For instance, if a driver is driving without a supervisor and this is a requirement of their licence, their licence will be considered invalid. Always carry vehicle insurance that meets the minimum coverage required by provincial standards. Each province has its own insurance standards and it is the driver’s responsibility to make sure they are insured. Proof of insurance must be carried in the vehicle at all times or the driver can be penalized (e.g., fines, accumulation of demerit points for failing to show proof of insurance). Drivers should note that if they are in a crash while unlicenced, their insurance company can refuse to pay for the claim. Keep your driver’s licence up to date and renewed, including the stickers on your licence plate. Beirness, D.J., Simpson, H.M., Mayhew, D.R. (1997). Evaluation of Administrative Licence Suspension and Vehicle Impoundment Programs in Manitoba. Transport Canada. TP-13096E. Traffic Injury Research Foundation. Ottawa, Canada. Best, A.L. (2006). Freedom, Constraint, and Family Responsibility: Teens and Parents Collaboratively Negotiate Around the Car, Class, Gender and Culture. Journal of Family Issues. 27(1), 55-84. Blows, S., Ivers, R.Q., Connor, J., Ameratunga, S., Woodward, M., Norton, R. (2005). Unlicenced Drivers and Car Crash Injury. Traffic Injury Prevention. 6, 230-234. DeYoung, D. J. (1997). An Evaluation of the Specific Deterrent Effect of Vehicle Impoundment on suspended, Revoked and Unlicensed Drivers in California. California Department of Motor Vehicles. Sacramento, California. Elliot, M.R., Ginsburg, F.K., Winston, F.K. (2008). Unlicensed teenage drivers: who are they and how do they behave when they are behind the wheel? Pediatrics. 122, e994-e1000. Fresno Police Department. (1999). Traffic Offender Program Final Report. Fresno, California. Hanna, C.L., Laflamme, L., Bingham, C.R. (2012). Fatal crash involvement of unlicensed young drivers: County level differences according to material deprivation and urbanicity in the United States. Accident Analysis and Prevention. 45, 291-295. Hanna, C.L. Taylor, D.M., Sheppard, M.A., Laflamme, L. (2006). Fatal crashes involving young unlicenced drivers in the U.S. Journal of Safety Research. 37, 385-393. Holderness, T. (2003). Reduce Traffic Collisions by Targeting Unlicensed Drivers. The Police Chief. 70(9). Alexandria, Virginia. Public Safety Canada. (2013). Funding for Automated Licence Plate Readers (ALPRs) by MPI for Manitoba Police Agencies (Details). Index of Policing Initiatives. Retrieved from: http://www.publicsafety.gc.ca/cnt/cntrng-crm/plcng/cnmcs-plcng/ndx/dtls-eng.aspx?n=81. Scopatz, R.A., Hatch, C.E., DeLucia, B.H., Tays, K.A. (2003). Unlicensed to Kill: The Sequel. AAA Foundation for Traffic Safety. Washington, D.C.
Sweedler, B.M. (2007). Unlicensed drivers: how big is the problem and what can be done about it? An International Perspective. 2nd International Traffic Expert Congress. June 2007. Vienna, Austria.